Pressure Cooker Holiday Spice Peppernuts Cheesecake a/k/a Pfeffernüsse is a festive Christmas dessert made with warm Cardamom and Cloves; perfect for Winter. My favorite Holiday cookie to make are my Peppernuts. They are a Christmas Spice Cookie, which are very popular in Denmark, Germany and the Netherlands. There is no pepper in Peppernuts. I was given this recipe in 1973, by my Dad’s second wife, who was from Wisconsin. Her family had/has roots in various cities around the Norwegian Sea. I still make Peppernuts every single year. They are a lot of work, but so worth it. The flavor is so wonderful and I wanted to capture that same flavor in an Instant Pot or Pressure Cooker cheesecake. 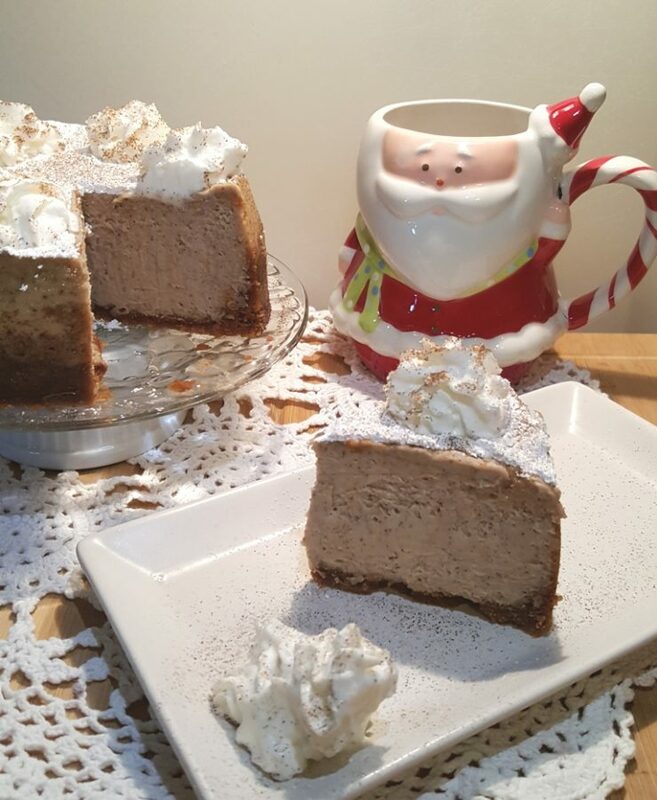 This Pressure Cooker Holiday Spice Peppernuts Cheesecake is just that. It’s so good, in fact, that I think I will have to dub this, “This Old Gal’s Signature Cheesecake. Oh my gosh, y’all, it’s soooooo good! And, it’s not a lot of work for a Cheesecake!!!! Uh oh, I am in trouble. 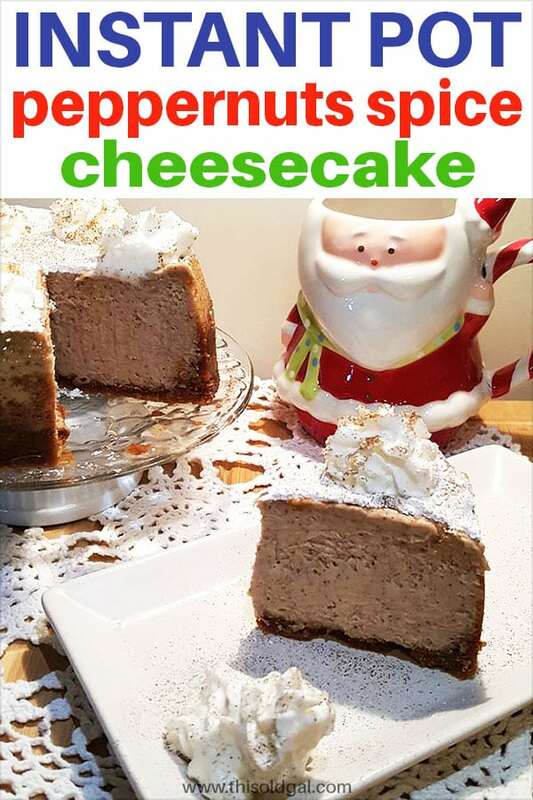 Before you get started making this Pressure Cooker Peppermint Milkshake Cheesecake, please read my article called Perfect Pressure Cooker Cheesecake Tips & Guide, so that your first cheesecake will be a success. 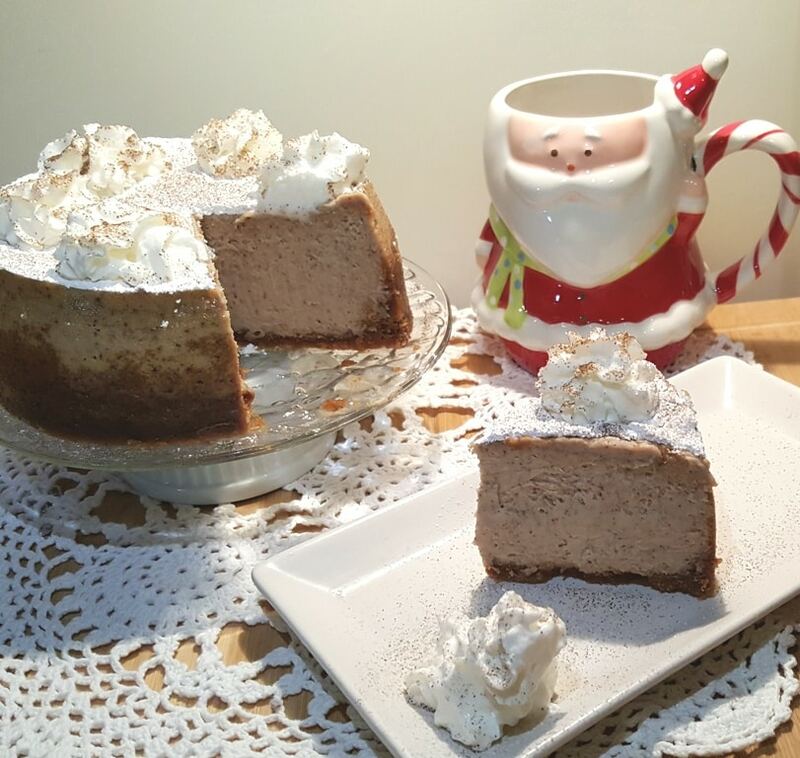 Other yummy Instant Pot and Pressure Cooker Holiday Cheesecakes to try are the my Pressure Cooker Peppermint Milkshake Cheesecake and Bourbon Pumpkin Pie Cheesecake (Pake). For a lighter cheesecake, try my Italian Ricotta Cheesecake or Italian Meyer Lemon Ricotta Cheesecake, which are 50% less calories. If you don’t have a food processor, take a large baggie and put the Biscoff Cookies inside. Seal it and take a rolling pin and crush the Biscoff Cookies. Pulse until small crumbs form. Add melted butter and combine. Try to resist the urge to drink the crust. Do take a little taste though, just to give yourself an idea of the goodness to come. Yum, right! I could sit down with a spoon now. I prefer the 6″ Fat Daddio’s Push Pan, because clean up is so very easy, but some people prefer a Spring Form Pan. Grease your Cheesecake Pan and then place a Parchment Round into the bottom of the pan. Grease the Parchment Round. If you don’t have parchment, don’t worry. It just might be a little more difficult to separate the cake from the bottom of the pan. 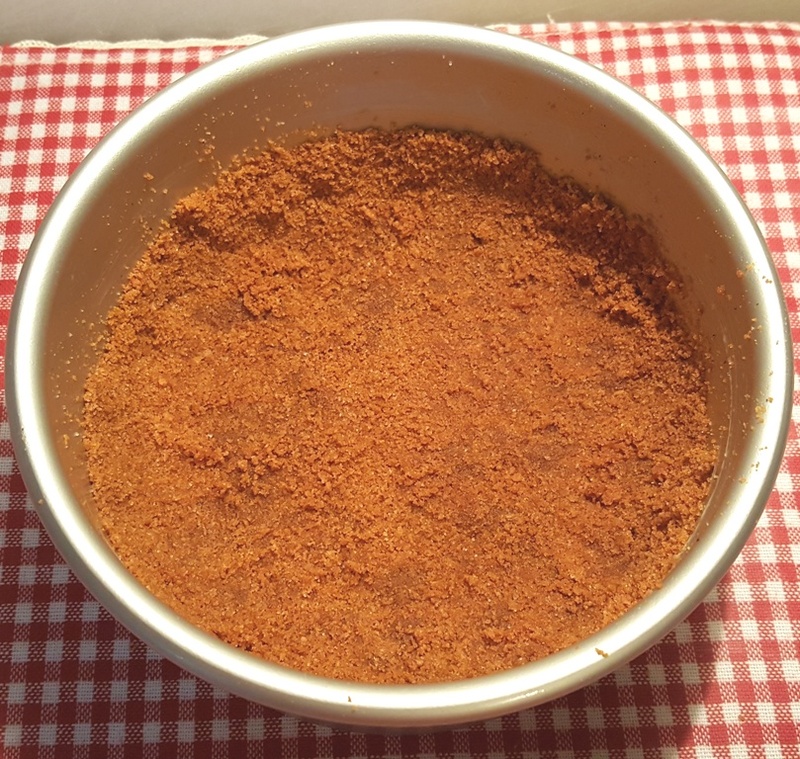 Press crumb mixture into pan using a Fox Run Tart Tamper or your fingers, forming a neat border around the edge and slightly up the sides. 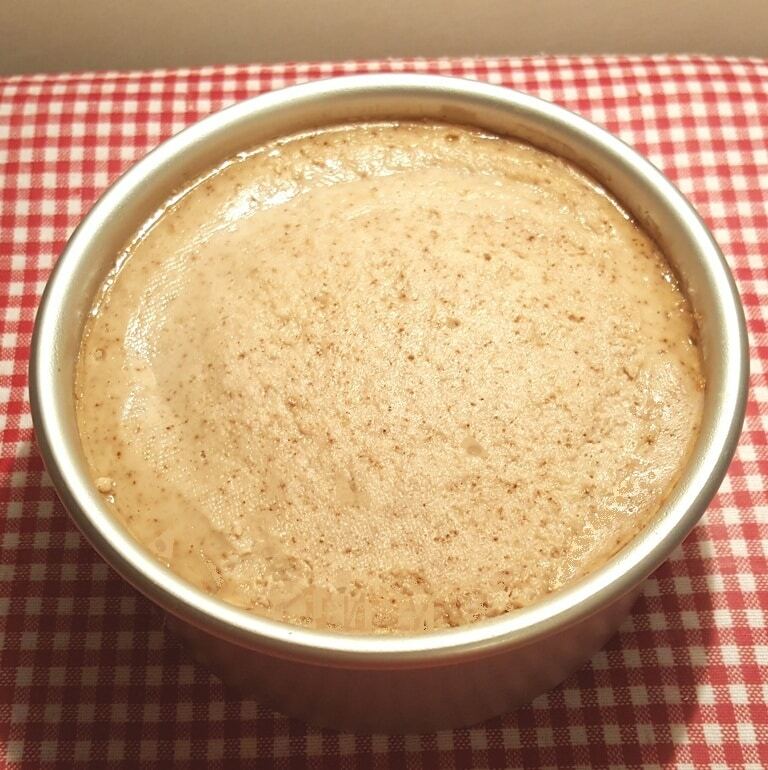 A tip for this Pressure Cooker Holiday Spice Peppernuts Cheesecake and all other cheesecakes, is that when pressing the crumbs into the cheesecake pan, don’t push them up too high on the sides. You don’t want moisture to get into the crust, causing a gummy crust. Place the pan with the crust into the freezer, while preparing the filling. Add the cream cheese, sugar, Dark Karo Sryup, heavy cream, spices and flour to your Food Processor. 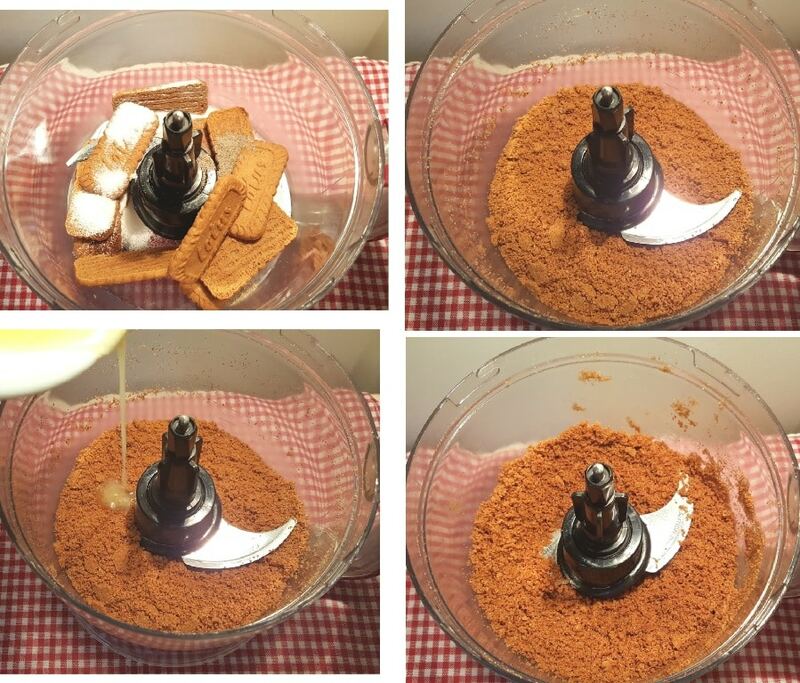 Blend the ingredients together until very smooth. It will come together quickly. This will be the last time you can go wild with your Food Processor or Blender! 🙂 You know why, right? Add one egg at a time. Just use the pulse button for one second after each egg added. It is okay if you see some of the yellow yolk. I feel like I need to yell this part, because I continue to see Cheesecakes, with overmixed eggs. What happens is that the eggs puff up as they cook and will over cook, so not only will you have a soufflé like Cheesecake, parts of it will be over cooked and the Cheesecake will crack. You will notice that this Cheesecake is a bit taller than many of my other Cheesecakes. Awesome right? Yeah, and those who want to use a 7 inch pan, will also have a taller Cheesecake, so it is all good. You shouldn’t see any of the Crust. Remember why? Scroll back up to see. Please Note where the filling comes up in the pan. A cooked Cheesecake should be the same height. If your Pressure Cooker Holiday Spice Peppernuts Cheesecake is taller than the uncooked version, you beat your eggs too much. It is cheap to make and you will find yourself using it all your Pot in Pot cooking. If you don’t want to make this Homemade Sling, you might prefer this Silicone Sling/ Vegetable Steamer which is a nice product. Some people like to use Grafiti Bands Cross Style as they make it so easy to get pans and bowls in and out of the Pressure Cooker. The Grafiti Bands will hold the paper towel in place nicely, as well. Cover lightly with a paper towel and foil. Using your Homemade Sling, lower the Cheesecake into the Pressure Cooker cooking pot. A cheesecake is done before the center of it is set. It will be a bit jiggly in the center and the sides will be slightly higher. If there is any water on top, just dab it off with a paper towel. Don’t feel the urge to cook longer or else the top will crack. The heat that is trapped inside will continue to cook the center while the cheesecake cools. Scroll back up and notice the height. It is the same baked as it is unbaked. That is a very good sign! Let the Cheesecake sit out on the counter for about an hour and then place it in the refrigerator. Any jar that will fit into the opening of the Push Pan will work. A Cheesecake desperately needs at least 12 hours in the refrigerator, so please, please, make your Cheesecake the day before you need it and let it set up properly in the refrigerator overnight. It will taste much, much, much, better. Really, I am not joking. 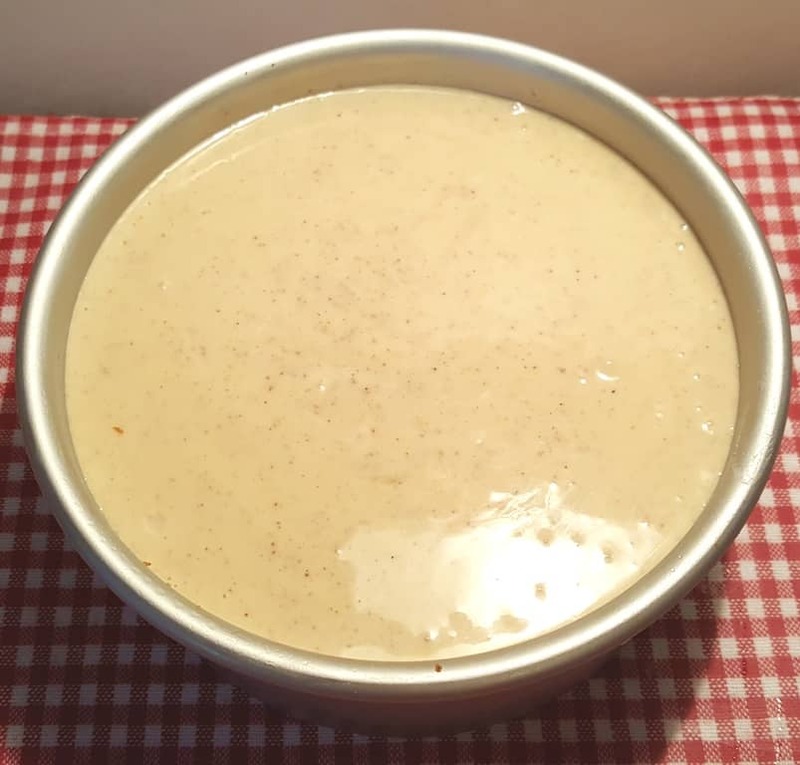 Your Pressure Cooker Holiday Spice Peppernuts Cheesecake will taste good on the same day, but will taste incredible the next day. I use this LamsonSharp Chef’s Slotted Turner to remove the cheesecake to a plate. 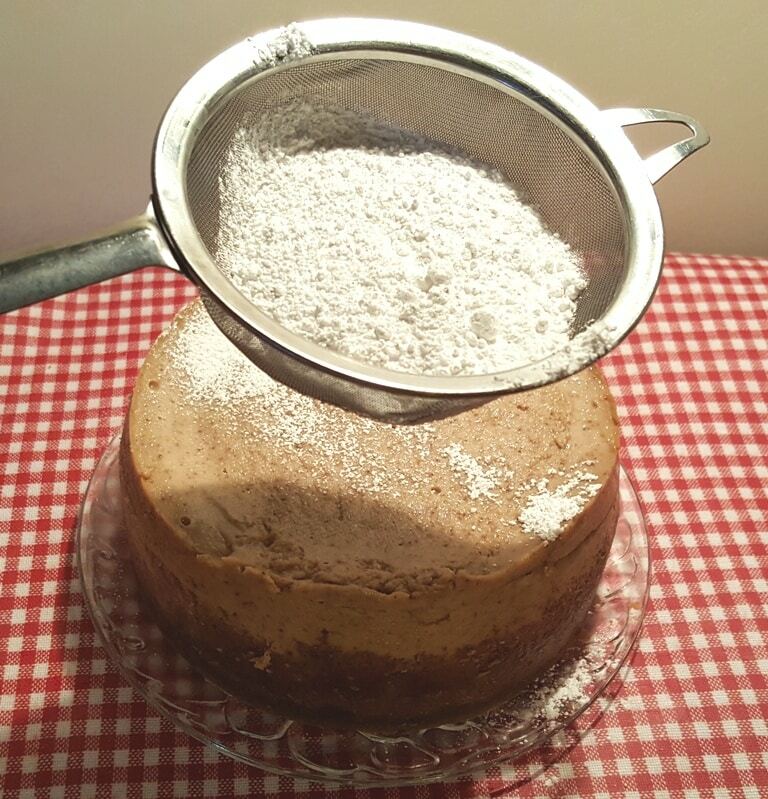 It’s super thin and fits easily between the Cheesecake and the base of the pan. When removing the Cheesecake from the Push Pan bottom, just peel off the Parchment Round and place on a plate. It is not a good idea to cut the cheesecake on top of the Push Pan base, as it will scratch and sticking will become a problem. Believe it or not, the Cheesecake is not very sweet. If you remember up above, I mentioned that Peppernuts are covered in Powdered Sugar. So, to keep with the theme, we’ll make the Cheesecake look like one big Peppernut. Right before presentation/serving, generously dust the Powdered Sugar all over the Top of the Cheesecake. If you do this in advance, the top will not be white, like snow. The cake really is not to sweet, so really lay down a thick layer of the Powdered Sugar. If you want to dust the sides with Powdered Sugar too, it would look awesome. 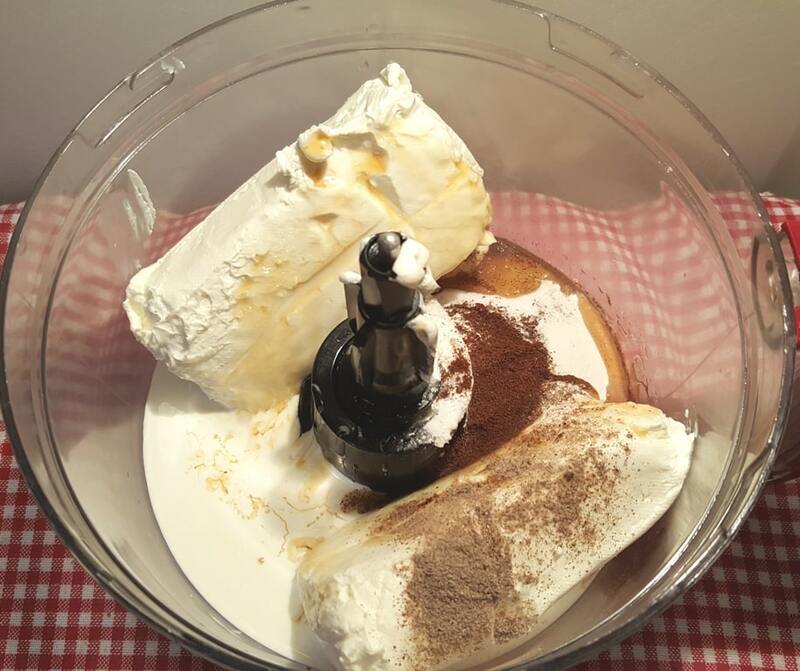 This Pressure Cooker Holiday Spice Peppernuts Cheesecake is not super sweet, so, I like to garnish it with my Perfect Homemade Whipped Cream and then a light sprinkling of Cardamom and Cloves for color. It’s so good and I can’t stop eating this! 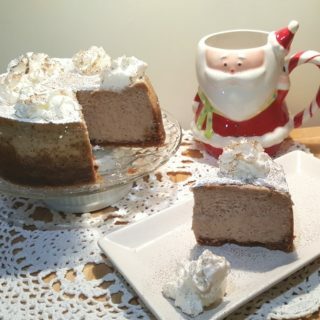 This Pressure Cooker Holiday Spice Peppernuts Cheesecake is awesome topped with Ice Cream and with a hot cup of coffee. Enjoy! Add Biscoff cookies, cardamom, cloves and sugar to the bowl of food processor and pulse a couple of times, until small crumbs form. 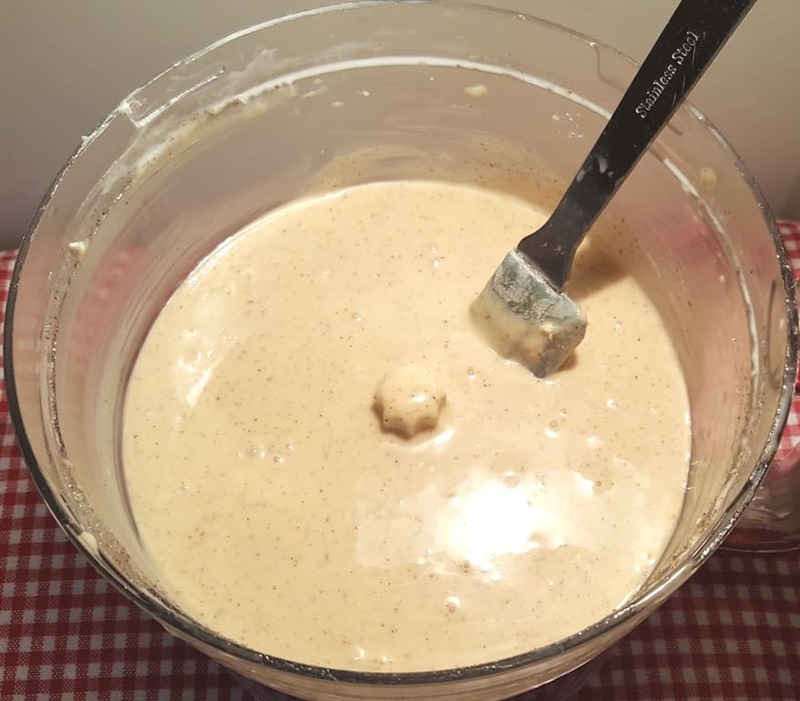 Melt butter in microwave or on stove top and add to cookie mixture. Pulse until just combined. 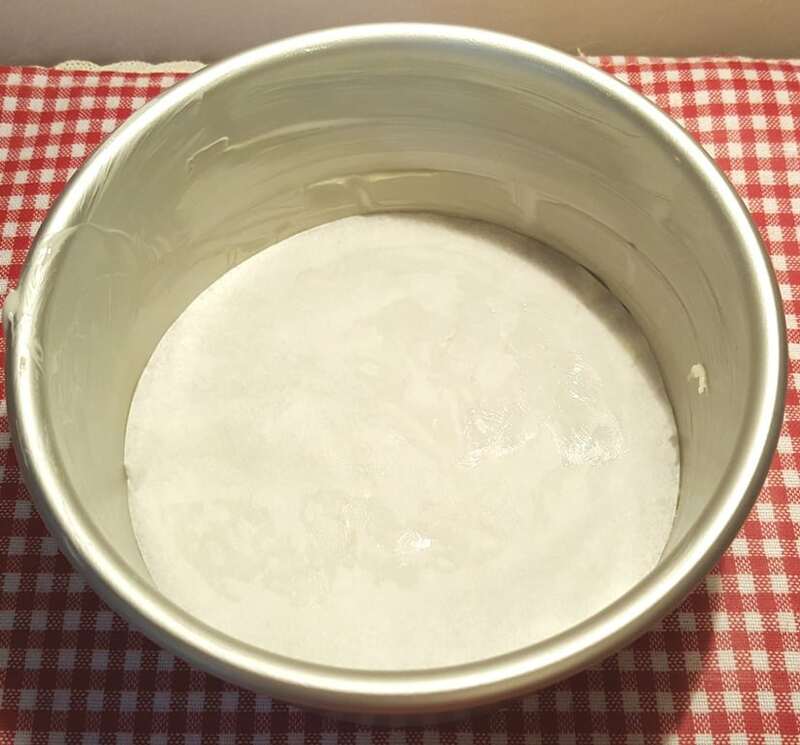 Pour cookie mixture into bottom of greased and lined 6-inch cheesecake pan and press the mixture firmly into the bottom of the pan and one inch up along the sides. 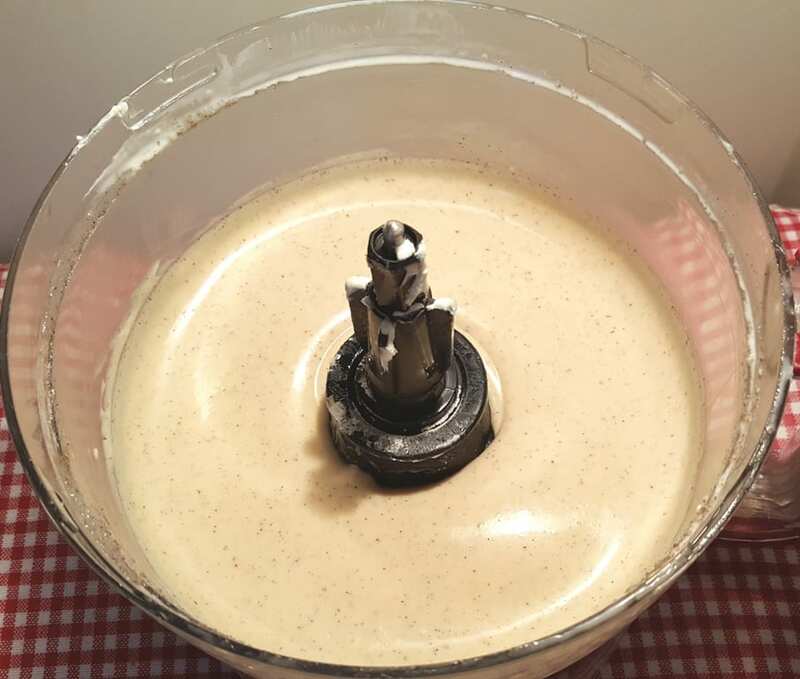 Blend together cream cheese, cloves, cardamom, cloves, Karo Syrup, heavy cream, salt, sugar and flour until smooth. 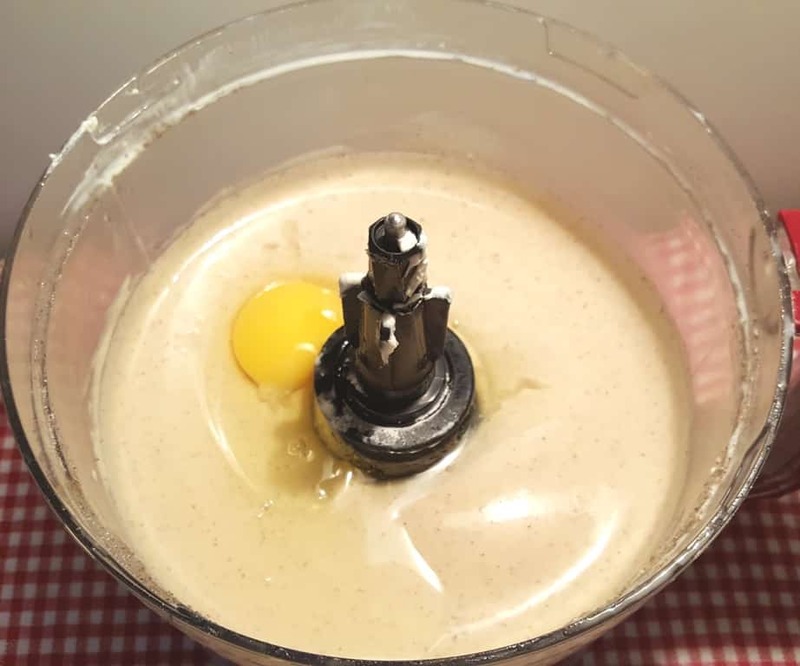 Add eggs, one at a time, mixing until just combined. Do not over mix the eggs. Pour filling into the pan, on top of the Biscoff Cookie crust. 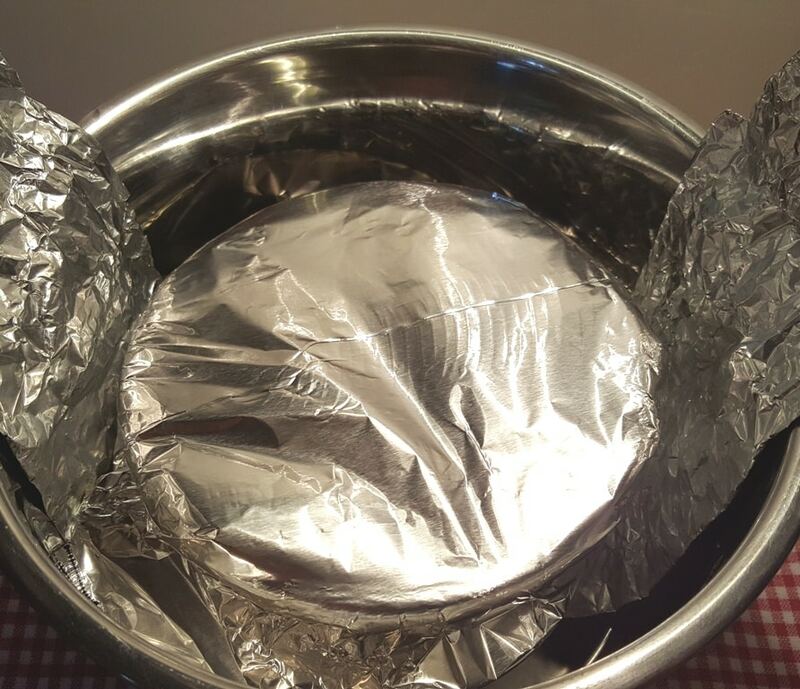 Cover the cheesecake first with a paper towel and then with a piece of aluminum foil and loosely secure the foil. Cook at High Pressure for 43 minutes. Allow a 15 minute natural release. After all pressure has been released, open pressure cooker and gently remove the pan. Remove the foil and paper towel and dab off any liquid that may have accumulated. 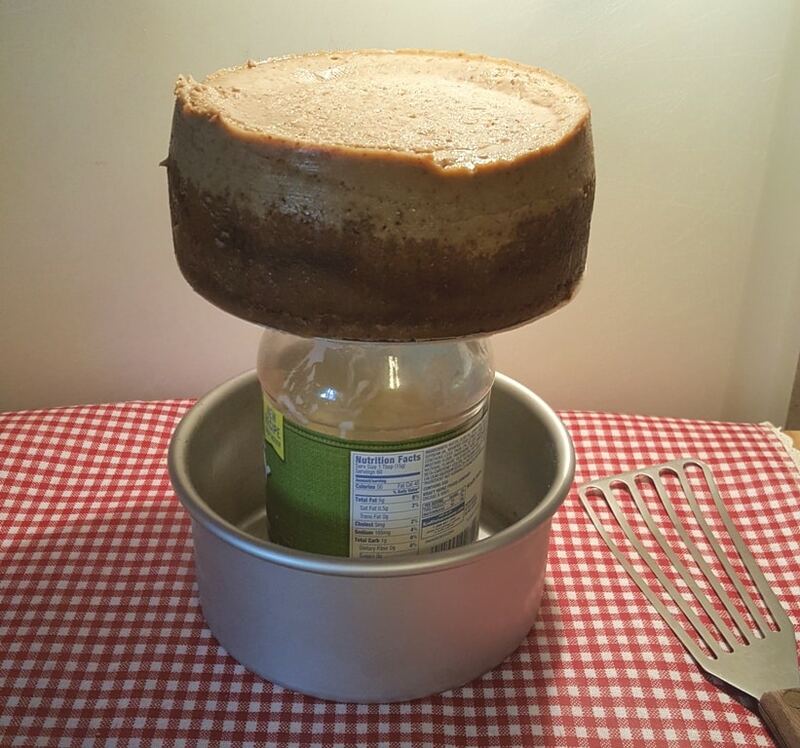 Leave Cheesecake on counter for one hour and then place in refrigerator overnight. Right before serving, use a sifter to dust a generous layer of Powdered Sugar over the Cheesecake, so that it is snow white. Garnish with whipped cream dollops and a very light dusting of cloves and cardamom, for color. Add the Powdered Sugar/Spice dusting, right before serving, otherwise, it will settle into the cheesecake and no longer be white. I personally like the height of the cheesecake in a 6 inch pan. The percentage of filling to crust is perfect. However, if you want to use a 7 inch pan, cook for 38 minutes with a 15 minute Natural Pressure Release. If using the mini 4 inch pans, cook for 13 minutes, with a 15 minute Natural Pressure Release. 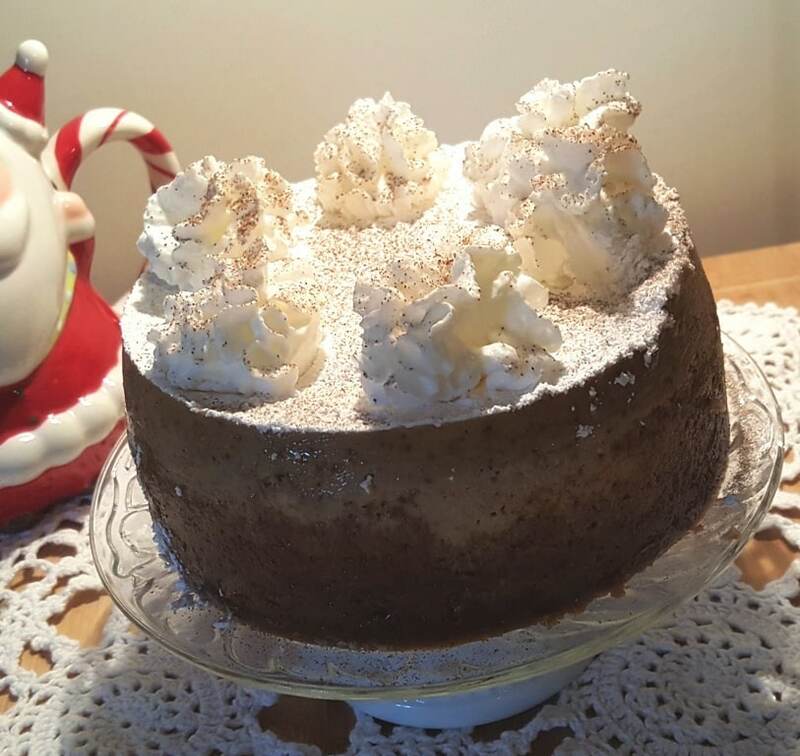 PIN this Pressure Cooker Holiday Spice Peppernuts Cheesecake (Pfeffernüsse)! Do you know of any substitutions that would work if you don’t have the Biscoff Cookies on hand or can’t find them in your local grocery store? Thanks! My mom grew up in Germany and has been making these cookies at Christmas for as long as I can rememeber. I cant wait to make the cheesecake version for her. Thank you! Hey….the recipe for peppernuts, handed down to me by my mother (from her aunt…and Belgian decent) actually does use black pepper! We do not coat ours with powdered sugar. They look more like a nugget…or kibble, as my nieces/nephew say…than a cookie. Only my mother has the recipe (she does not make them, however; my aunt, who will not be making them anymore as she is afflicted with cancer and is too tired, and myself. I have a boat load of nieces and a sister I should teach so we don’t lose the holiday tradition. Those nieces of mine have stronger hand for mixing than I do anyway! I will try your recipe this Christmas!! Be well! J. This sounds delicious! I will make this for Thanksgiving. 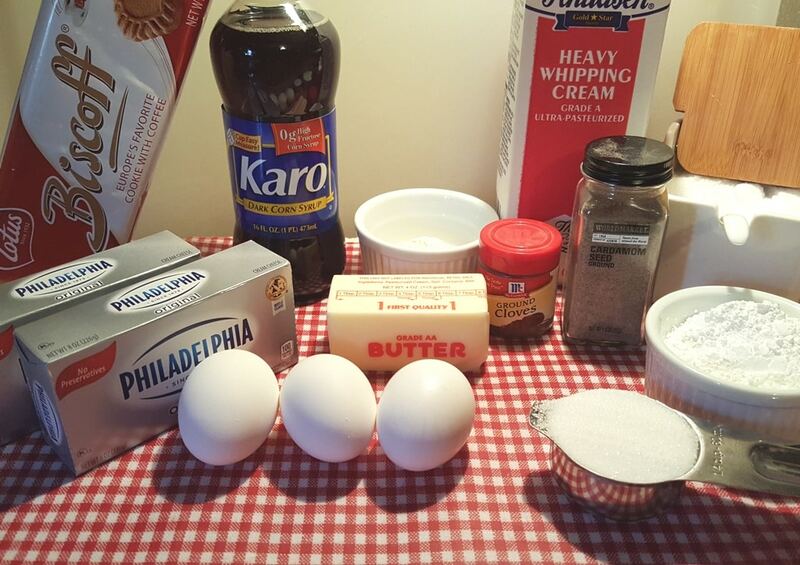 What is the chance you would share the cookie recipe with a gal from Wisconsin? 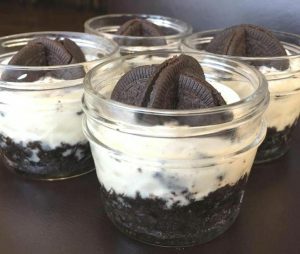 If you wanted to make this in a regular oven, what temp do you think, how long to bake, and would you need a water bath? I’m asking for a friend I’ve never met in person and don’t know if she has a pressure cooker. Thank you in advance. Also, wondering if you could share your peppernut cookie recipe with us…thank you in advance. Any chance you have plans to share your peppernut cookie recipe? 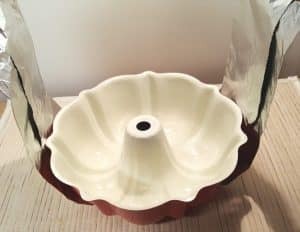 I too grew up with my German grandmother making peffernuese at Christmas time and the recipe died with her. Ever year I start an internet search for something close, but you are right, lots of recipes include pepper which is not how I remember them! Anyway, i am making this cheesecake today and am looking forward to tasting it tomorrow. Thanks!